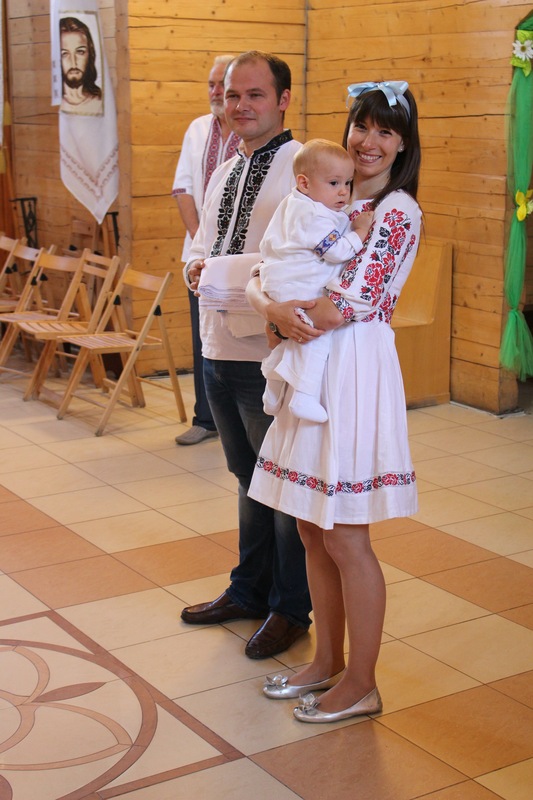 Today has confirmed that family runs deeper than blood and it has been my utmost honor to become Godmother to sweet baby Oleksa, who happens to be the son of one of my best friends, Oksana, and her husband Andriy. From this day forward, I am also responsible for being present in a little one’s life! As a Protestant, I didn’t grow up with any godparents, but had many people in several different churches take an interest in my life and guide me in the Way. So the opportunity for me to become a godparent is very humbling, flattering, and was a cause of great happiness for me when I agreed to accept the responsibility. 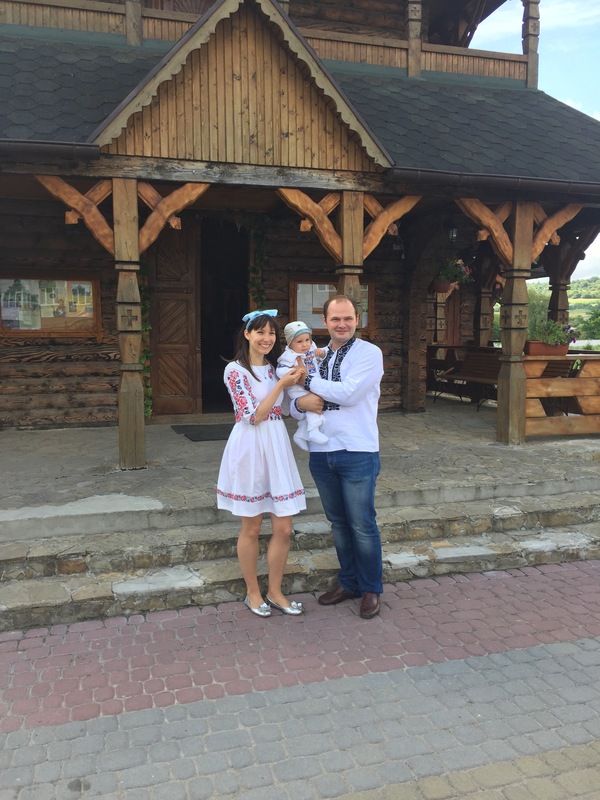 When ATeam was in our European Adventure planning phase in January 2016, I got a delightful email from Oksana asking me to be the Godmother to Oleksa. Actually, the email stirred up several emotions and I was happy to tell many people that I’ll be a godmother, but I was so overwhelmed with joy and humility that I usually did so with many tears in my eyes. Not that anyone who knows me well would expect any less! Drew got right on planning for a week in Ukraine in the middle of our Italy month and we made our way through Kiev via Amsterdam over the weekend, took a train to Lviv, then to Zolochiv yesterday. 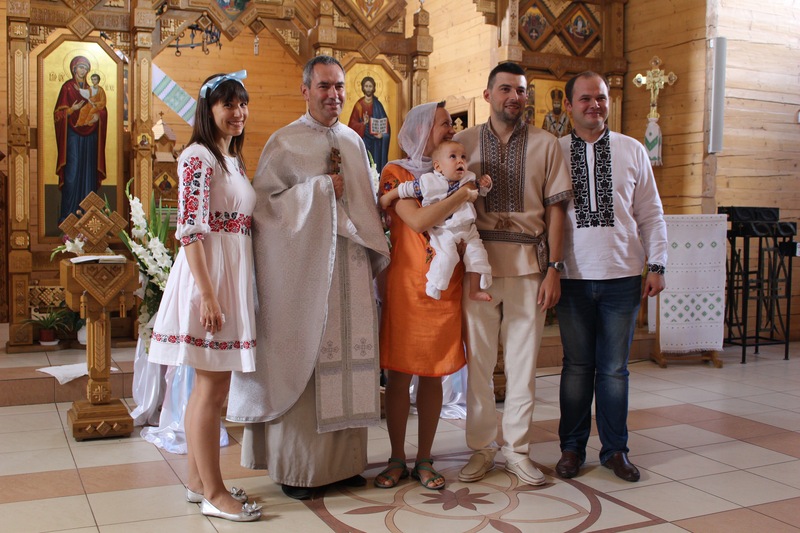 The baptism was held in a beautiful wooden Greek Catholic Church in Zolochiv. In fact, it is the very day and church where Oksana and Andriy were married 3 years ago! What a trip down memory lane this brought for ATeam, and how nostalgic I was when we checked into the exact same hotel that we had stayed in for their wedding. Many of the traditions and words that were said went over my head and I did not understand most of the service. The family was asked to enter the church and Pavlo (godfather) and I stood inside near the entrance to the church, each holding a крижма, or a piece of cloth to hold the baby with. Pavlo held Oleksa first and the priest anointed his chest, foot, hand, back, and head with oil. Oleksa then came to me and he was annointed with oil in my arms. Around this time, poor baby got a little fussy and rightly so! The three of us turned away from the church to face the entrance which we came from and we promised (I believe/hope, since I didn’t really understand;) that we would uphold Oleksa in the Way and be present in his life. Once we turned around, we entered the main section of the church and stood in front of the altar. Oksana joined us to try and keep Oleksa’s spirits up. Pavlo and I held him as the priest sprinkled water on Oleksa’s head three times, and the крижма proved useful for wiping him off! Of course, poor baby needed mommy after that, so after a pass-off to the priest, she held him for the remainder of the service. Pavlo and I were also given candles which we held for a majority of the time. After being baptized, Oksana took Oleksa to the same place she knelt during her wedding and the priest sprinkled water on both of them together. Then the priest walked around a separate altar with Oleksa and bowed him towards the relic there three times. Somewhere in there, I’m sure there was also a homily, and the service was ended with all of us singing мно гаяа лето, which I actually knew since we used to sing it on birthdays with our students when I worked as a music teacher in Ukraine! I was happy to at least be able to sing something in the service! After the christening, we all enjoyed pictures and a lunch. ATeam’s current home-base is Tashkent, Uzbekistan. Andriy, Oksana, and Oleksa currently reside in Penang, Malaysia. It’s certain that I won’t make it to every birthday, but regardless of that fact, I will be Oleksa’s Godmother and I will love him, pray for him, and be as present as possible in his journey through life. Most important of all: we entered the church as friends and we came out as family.